Jim O’Connor majored in Geological Science at University of Washington and earned M.S. and Ph.D. degrees at University of Arizona. Since 1991, he has worked at the U.S. Geological Survey, intent on improving understanding of the processes and events that shape the remarkable and diverse landscapes of the Pacific Northwest. 1) Improve understanding of the late Neogene and Quaternary history of the Columbia River basin so to provide a framework for studies of hazards (earthquakes, landslides, floods), resources (ground water, aggregate, cultural heritage), and ecologic systems (habitat formation, evolution of aquatic systems, ecologic disturbances). confluence) to the Pacific Ocean. synthesis understanding of the Quaternary and Neogene history of the lower Columbia River. This work, with a variety of collaborators and funding sources, is part of a career-long effort to better understand flood processes, including those that generate floods as well as assessing the effects of floods on landscapes. Analyses of gaged and historic records of flooding are complimenting ongoing field-based studies of flood deposits and erosional features, aimed at (1) improving flood hazard assessments for specific locations; (2) investigating linkages between millennial-scale climate change, geologic environment and flood magnitude and frequency, and (3) evaluating the roles of floods from meteorological sources and natural dam failures on long-term valley evolution. Such studies have been recently completed for the Deschutes River, Oregon, Owyhee River, Oregon, and for the Black Hills region of South Dakota. This work encompasses a variety of research and review activities focused on aiding land-management and regulatory agencies with issues regarding fluvial geomorphology, sediment transport, channel migration, and related habitat and hazards issues. 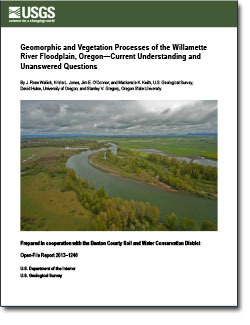 One major effort has been devoted to assessment of sediment transport, channel migration and historical changes to rivers in the Pacific Northwest; thereby assisting counties, Indian Nations, and state and federal agencies in assessing channel change and providing a rational basis for establishing regulatory channel migration zones for protection of river channel processes and for prioritization of restoration activities. Recent and ongoing projects include studies of the Columbia River, Deschutes River, Oregon, the Sprague River, Oregon, the Willamette River, and several watersheds in coastal Oregon. Another major effort, building on analyses of dam removals on the Sandy River, Oregon, and White Salmon River, Washington is the analysis of the effects of dams and dam removal on rivers, including participation in a working group on dam removal convened as part of the John Wesley Powell Center for Analysis and Synthesis. O’Connor, J.E., Atwater, B.F., Cohn, T.A., Cronin, T.M., Keith, M.K., Smith, C.G., and Mason, R.R., 2014, Assessing inundation hazards to nuclear powerplant sites using geologically extended histories of riverine floods, tsunamis, and storm surges: U.S. Geological Survey Scientific Investigations Report 2014–5207, 66 p.
Jones, K.L., Keith, M.K, O’Connor, J.E., Mangano, J.F., and Wallick, J.R., 2012, Preliminary assessment of channel stability and bed-material transport in the Tillamook Bay tributaries and Nehalem River basin, northwestern Oregon: U.S. Geological Survey Open-File Report 2012–1187, 120 p.
Driscoll, D.G., Huft, D.L., and O’Connor, J.E., Extreme floods in the Black Hills Area: New insights from recent research. South Dakota Department of Transportation Fact Sheet SD2008-01_Fact_Sheet_06-11-12, 4 p.
Major, J.J., O’Connor, J.E., Podolak, C.J., Keith, M.K., Grant, G.E., Spicer, K.R., Pittman, S., Bragg, H.M., Wallick, J.R., Tanner, D.Q., Rhode, A., and Wilcock, P.R., 2012, Geomorphic response of the Sandy River, Oregon, to removal of Marmot Dam: U.S. Geological Survey Professional Paper 1792, 64 p. and data tables. Jones, K.L., O’Connor, J.E., Keith, M.K., Mangano, J.F., and Wallick, J.R., 2012, Preliminary assessment of channel stability and bed-material transport in the Rogue River basin, southwestern Oregon: U.S. Geological Survey Open-File Report 2011–1280, 96 p.
Jones, K.L., O’Connor, J.E., Keith, M.K., Mangano, J.F., and Wallick, J.R., 2012, Preliminary assessment of channel stability and bed-material transport in the Coquille River basin, southwestern Oregon: U.S. Geological Survey Open-File Report 2012–1064, 84 p.
Simenstad, C.A., Burke, J.L., O’Connor, J.E., Cannon, C., Heatwole, D.W., Ramirez, M.F., Waite, I.R., Counihan, T.D., Jones, K.L., 2011, Columbia River Estuary Ecosystem Classification —Concept and Application: U.S. Geological Survey Open-File Report 2011-1228, 54 p.
Harden, T.M., O’Connor, J.E., Driscoll, D.G., and Stamm, J.F., 2011, Flood-frequency analyses from paleoflood investigations for Spring, Rapid, Boxelder, and Elk Creeks, Black Hills, western South Dakota: U.S. Geological Survey Scientific Investigations Report 2011–5131, 136 p.
Jones, K.L, Wallick, J.R., O’Connor, J.E., Keith, M.K., Mangano, J.F., Risley, J.C., 2011, Preliminary assessment of channel stability and bed-material transport along Hunter Creek, southwestern Oregon: U.S. Geological Survey Open-File Report 2011–1160, 41 p.
Wallick, J.R., and O'Connor, J.E., 2011, Estimation of bed-material transport in the lower Chetco River, Oregon, water years 2009–2010: U.S. Geological Survey Open-File Report 2011–1123, 12 p.
Wallick, J.R., Anderson, S.W., Cannon, Charles, O’Connor, J.E., 2010, Channel change and bed-material transport in the lower Chetco River, Oregon: U.S. Geological Survey Scientific Investigations Report 2010–5065, 68 p.
O’Connor, J.E., Dorsey, R.J., and Madin, I.P., eds., 2009, Volcanoes to Vineyards: Geologic Field Trips through the Dynamic Landscape of the Pacific Northwest: Geological Society of America Field Guide 15, 874 p.
Wallick, J.R., Anderson, S.W., Cannon, Charles, and O'Connor, J.E., 2009, Channel change and bed-material transport in the lower Chetco River, Oregon: U.S. Geological Survey Open-File Report 2009-1163, 83 p.
O'Connor, J.E., Wallick, J.R., Sobieszczyk, Steven, Cannon, Charles, and Anderson, S.W., 2009, Preliminary assessment of vertical stability and gravel transport along the Umpqua River, Oregon: U.S. Geological Survey Open-File Report 2009-1010, 40 p.
Evarts, R.C., and O'Connor, J.E., 2008, Geologic Map of the Camas Quadrangle, Clark County, Washington, and Multnomah County, Oregon, U.S. Geological Survey Scientific Investigations Map 3017 (with 32 p. accompanying descriptive and interpretative pamphlet). O'Connor, J.E., and Costa, J.E., 2004, The World's largest floods, past and present-Their causes and magnitudes: U.S. Geological Survey Circular 1254, 13 p.
O'Connor, J.E., and Costa, J.E., 2003, Large floods in the United States: Where they happen and why: U.S. Geological Survey Circular 1245, 13 p.
O'Connor, J.E., and Grant, G.E., editors, 2003, A peculiar river: Geology, geomorphology, and hydrology of the Deschutes River, Oregon: American Geophysical Union Water Science and Application Series, no. 7, 220 p.
O'Connor, J.E., Hardison, J.H., III, and Costa, J.E., 2001, Debris flows from failures of Neoglacial moraine dams in the Three Sisters and Mt. Jefferson Wilderness Areas, Oregon: U.S. Geological Survey Professional Paper 1608, 93 p.
O'Connor, J.E., Sarna Wojcicki, A.M., Wozniak, K.C., Polette, D.J., and Fleck, R. J., 2001, Origin, extent, and thickness of Quaternary geologic units in the Willamette Valley, Oregon: U.S. Geological Survey Professional Paper 1620, 52 p.
O'Connor, J. E., 1993, Hydrology, hydraulics, and geomorphology of the Bonneville Flood: Geological Society of America Special Paper 274, 83 p.
Safran, E.B., O’Connor, J.E., Ely, L.L., House, P.K., Grant, G. Harrity, K., Croall, K., Jones, E., 2015, Plugs or flood-makers? The unstable landslide dams of eastern Oregon. Geomorphology, v. 248, p. 237-251. O’Connor, J.E., Duda, J.J., Grant, G.E., 2015, 1000 dams down and counting. Science, v. 348 (6234), p. 496-497. Harden, T.M, O’Connor, J.E., and Driscoll, D.G., 2015, Late Holocene Flood Probabilities in the Black Hills, South Dakota with emphasis on the Medieval Climate Anomaly. Catena, v. 130, p. 62-68. Gilmour, D.M., Butler, V.R., O’Connor, J.E., Davis, E.B., Culleton, B.J., Kennett, D.J., and Hodgins, G., 2015, Chronology and ecology of late Pleistocene megafauna in the northern Willamette Valley, Oregon: Quaternary Research, v. 83, p. 127-136. O’Connor, J.E., and East, A., 2014, Synthesizing studies of dam removal: Dam removal; synthesis of ecological and physical response; Fort Collins, Colorado, 16-20 June, 2014 (Meeting Report): Eos, v. 95, no. 40, p. 363-364. O’Connor, J.E., 2013, Our vanishing glaciers—One hundred years of glacier retreat in the Three sisters Area, Oregon Cascade Range: Oregon Historical Quarterly, v. 114, no. 4, p. 402-427. Levy, J.S., Fountain, A G., O’Connor, J.E., Welch, K.A., and Lyons, W.B., 2013, Garwood Valley Antarctica: A new record of last glacial maximum to Holocene glaciofluvial processes in the McMurdo Dry Valleys: Geological Society of America Bulletin, v. 125, p. 1484-1502, doi: 10.1130/B30783.1. O’Connor, J.E. and Beebee, R.A., 2009, Floods from natural rock-material dams, in Burr, D., Carling, P., and Baker, V. editors, Megafloods on Earth and Mars: Cambridge University Press, p. 128-171. Evarts, R.C., O'Connor, J.E., Wells, R.E., and Madin, I.P., 2009, The Portland Basin: A (big) river runs through it: GSA Today, v. 10, no. 9 p. 4-10. Marcott, S.A., Fountain, A.G., O'Connor, J.E., Sniffen, P.J., Dethier, D.P., 2009, A latest Pleistocene and Holocene glacial history and paleoclimate reconstruction at Three Sisters and Broken Top Volcanoes, Oregon, U.S.A.: Quaternary Research, v. 71, p. 181-189. O'Connor, J., Major, J., and Grant, G., 2008, The dams come down: Unchaining U.S. Rivers: Geotimes, v. 53, no. 3, p. 22-28. Major, J.J, O'Connor, J.E. Grant, G.E. Spicer, K.R., Bragg, H.M., Rhode, A., Tanner, D. Q., Anderson, C.W. and Wallick J.R., 2008, Initial fluvial response to the removal of Oregon's Marmot Dam, EOS, Transactions, American Geophysical Union, v. 89, p. 241-242. O'Connor, J.E., 2004, The evolving landscape of the Columbia River Gorge-Lewis and Clark and cataclysms on the Columbia: Oregon Historical Quarterly, v. 105, no. 3, p. 390-421. Butler, V.L., and O'Connor, J.E., 2004, 9000 years of salmon fishing on the Columbia River: Quaternary Research, v. 62, p. 1-8. O'Connor, J.E., and Costa, J.E., 2004, The spatial distribution of the largest rainfall-runoff floods from basins between 2.6 and 26,000 km2 in the United States and Puerto Rico: Water Resources Research, 40, W01107, doi:10.1029/2003WR002247. Benito, G., and O'Connor, J.E., 2003, Number and size of last-glacial Missoula floods in the Columbia River valley between the Pasco Basin, Washington, and Portland, Oregon: Geological Society of America Bulletin, v. 115, p. 624-638. Walder, J. S., and O'Connor, J.E., 1997, Methods for predicting peak discharge of floods caused by failure of natural and constructed earthen dams: Water Resources Research, p. 2337 2348. O'Connor, J. E, Ely, L. L., Wohl, E. E., Stevens, L. D., Melis, T. S., Kale, V. S., and Baker, V. R., 1994, A 4000-year record of extreme floods on the Colorado River in the Grand Canyon: Journal of Geology, v. 102, p. 1-9. O'Connor, J. E., and Costa, J. E., 1993, Geologic and hydrologic hazards in glacierized basins resulting from 19th and 20th century global warming: Natural Hazards, v. 8, no. 2, p. 121-140. O'Connor, J. E., and Baker, V. R., 1992, Magnitudes and implications of peak discharges from Glacial Lake Missoula: Geological Society of America Bulletin, v. 104. p. 267-279. O'Connor, J. E., and Chase, C. G., 1989, Uplift of the San Pedro Martir, Baja California, Mexico: Tectonics, v. 8, p. 833-844. O'Connor, J. E., Webb, R. H., and Baker, V. R., 1986, Paleohydrology of pool-and-riffle pattern development: Boulder Creek, Utah: Geological Society of America Bulletin, v. 97, p. 410-420. O’Connor, J.E., Clague, J.J., Walder, J.S., Manville, V., and Beebee, R.A., 2013, Outburst Floods, in Shroder, J. (Editor in Chief), Wohl, E.E., ed., Treatise on Geomorphology, v. 9 (Fluvial Geomorphology), Academic Press, San Diego, California, p. 475-510. Grant, G.E., O’Connor, J.E., and Wolman, R.G., 2013, A river runs through it: conceptual models in fluvial geomorphology, in Shroder, J. (Editor in Chief), Wohl, E.E., ed., Treatise on Geomorphology, v. 9 (Fluvial Geomorphology), Academic Press, San Diego, California, p. 6-21. Benito, G., and O'Connor, J.E., 2013, Quantitative paleoflood hydrology, in Shroder, J. (Editor in Chief), Wohl, E.E., ed., Treatise on Geomorphology, v. 9 (Fluvial Geomorphology), Academic Press, San Diego, California, p. 459-474. Major, J.J., O’Connor, J.E., Podolak, C.J., Keith, M., Spicer, K.R., Wallick, J.R., Bragg, H.M., Pittman, S., Wilcock, P.R., Rhode, A., Grant, G.E., 2010, Evolving fluvial response of the Sandy River, Oregon, following removal of Marmot Dam. Proceedings of the 9th Federal Interagency Sedimentation Conference, Las Vegas, NV, June 27-July 1, 2010, 11 p.
O’Connor, J.E., and Burns, S.F., 2009, Columbia cataclysms and controversy—Aspects of the geomorphology of the Columbia River Gorge, in O’Connor, J.E., Dorsey, R.J., and Madin, I.P., eds., Volcanoes to Vineyards: Geologic Field Trips through the Dynamic Landscape of the Pacific Northwest: Geological Society of America Field Guide 15: p. 237–251, doi: 10.1130/2009.fld015(12). O'Connor, J.E., Curran, J.H., Beebee, R.A., Grant, G.E., and Sarna-Wojcicki, A., 2003, Quaternary geology and geomorphology of the lower Deschutes River canyon, Oregon, in, O'Connor, J.E., and Grant, G.E., eds., A Peculiar River-Geology, Geomorphology, and Hydrology of the Deschutes River, Oregon: American Geophysical Union Water Science and Application Series No. 7, pp. 73-94. O'Connor, J.E. Grant, G.E., and Haluska, T.L., 2003, Overview of geology, hydrology, geomorphology, and sediment budget of the Deschutes river basin, Oregon, in, O'Connor, J.E., and Grant, G.E., eds., A Peculiar River-Geology, Geomorphology, and Hydrology of the Deschutes River, Oregon: American Geophysical Union Water Science and Application Series No. 7, pp. 7-29. Curran, J.H., and O'Connor, J.E., 2003, Formation and evolution of valley-bottom and channel features, lower Deschutes River, Oregon, in, O'Connor, J.E., and Grant, G.E., eds., A Peculiar River-Geology, Geomorphology, and Hydrology of the Deschutes River, Oregon: American Geophysical Union Water Science and Application Series No. 7, pp. 95-119. Hosman, K.J., Ely, L.L., and O'Connor, J.E., 2003, Holocene paleoflood hydrology of the lower Deschutes River, Oregon, in, O'Connor, J.E., and Grant, G.E., eds., A Peculiar River-Geology, Geomorphology, and Hydrology of the Deschutes River, Oregon: American Geophysical Union Water Science and Application Series No. 7, pp. 121-146. Beebee, R.A., and O'Connor, J.E., 2003, The outhouse flood: a large Holocene flood on the lower Deschutes River, Oregon, in, O'Connor, J.E., and Grant, G.E., eds., A Peculiar River-Geology, Geomorphology, and Hydrology of the Deschutes River, Oregon: American Geophysical Union Water Science and Application Series No. 7, pp. 147-168. Jacobson, R.B., O'Connor, J.E., and Oguchi, Takashi, 2003, Surficial geologic tools in fluvial geomorphology, in Kondolf, G, M., and Piegay, Herve, eds., Tools in fluvial geomorphology, John Wiley and Sons, pp. 25-57. O'Connor, J.E., Grant, G.E., and Costa, J.E., 2002, The geology and geography of floods, in House, P.K., Webb, R.H., Baker, V.R., and Levish, D.R., Ancient floods, modern hazards: principles and application of paleoflood hydrology: American Geophysical Union Water Science and Application Series, No. 5, pp. 359-385. Beebee, R.A., O'Connor, J.E., and Grant, G.E., 2002, Field trip guide to the geology and geomorphology of the lower Deschutes River canyon, in Moore, G.W., ed., Field Guide to Geologic Processes in Cascadia, Oregon Department of Geology and Mineral Industries Special Paper 36, pp. 91-108. Costa, J. E., and O'Connor, J. E., 1995, Geomorphically effective floods, in, Costa, J.E., Miller, A.J., Potter, K.W., and Wilcock, P.R., eds., Natural and anthropogenic influences in fluvial geomorphology, Geophysical Monograph 89 (American Geophysical Union), pp. 45-56. O'Connor, J. E., and Webb, R. H., 1988, Hydraulic modeling for paleoflood analysis, in, Baker, V. R., Kochel, R. C., and Patton, P. C., eds., Flood Geomorphology, New York, John Wiley and Sons, pp. 393-402. Webb, R.H., O'Connor, J.E., and Baker, V.R., 1988 Paleohydrologic reconstruction of flood frequency on the Escalante River, south-central Utah, in Baker, V.R., Kochel, R.C., and Patton, P.C., eds., Flood Geomorphology, New York, John Wiley and Sons, pp. 403-418. Davis, Lisa; Harden, Tessa M.; Muñoz, Samuel E.; Godaire, Jeanne E.; O'Connor, Jim E.
Abril-Hernández, J.M., Periáñez, R., O'Connor, J.E., and Garcia-Castellanos, D., 2018, Computational Fluid Dynamics simulations of the Late Pleistocene Lake Bonneville Flood: Journal of Hydrology, v. 561, p. 1-15, https://doi.org/10.1016/j.jhydrol.2018.03.065. O'Connor, J.E., 2018, James Dwight Dana and John Strong Newberry in the US Pacific Northwest; the roots of American fluvialism: The Journal of Geology, v. 126, https://doi.org/10.1086/695701. 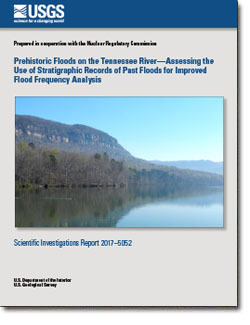 Harden, Tessa M.; O'Connor, Jim E.
Harden, T.M., and O’Connor, J.E., 2017, Prehistoric floods on the Tennessee River—Assessing the use of stratigraphic records of past floods for improved flood-frequency analysis: U.S. Geological Survey Scientific Investigations Report 2017–5052, 15 p., https://doi.org/10.3133/sir20175052. 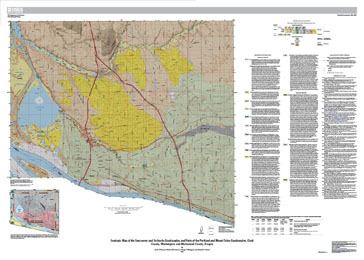 O'Connor, Jim E.; Cannon, Charles M.; Mangano, Joseph F.; Evarts, Russell C.
O’Connor, J.E., Cannon, C.M., Mangano, J.F., and Evarts, R.C., 2016, Geologic map of the Vancouver and Orchards quadrangles and parts of the Portland and Mount Tabor quadrangles, Clark County, Washington, and Multnomah County, Oregon: U.S. Geological Survey Scientific Investigations Map 3357, scale 1:24,000, http://dx.doi.org/10.3133/sim3357.